Perhaps you’ve been wondering if Pinterest marketing courses are worth the investment. In today’s podcast, I set out to answer this question. 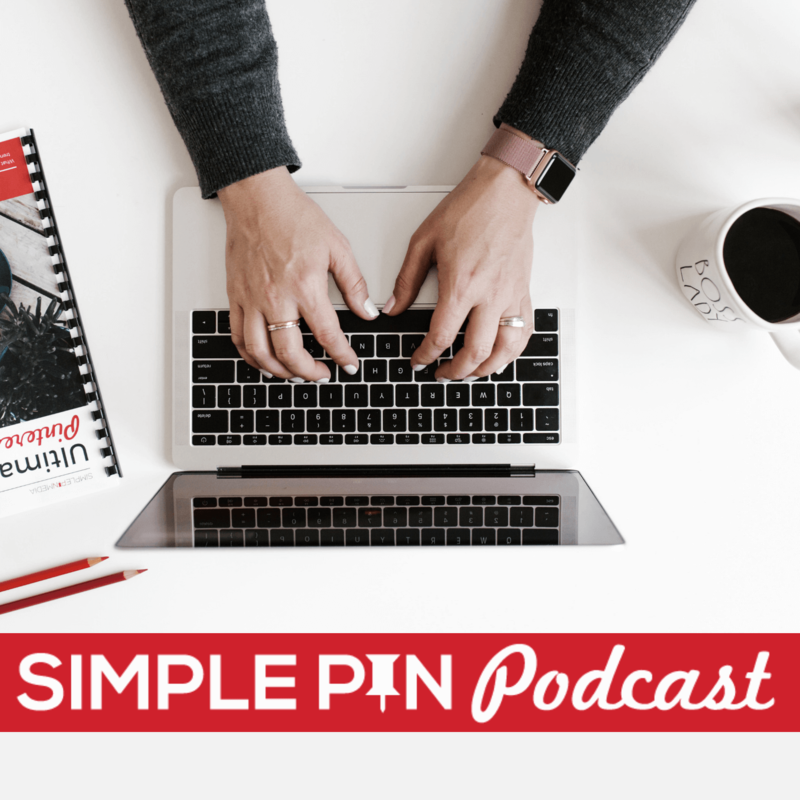 **I recorded this podcast in August of 2017 and have since closed the Simple Pin Mastercourse. I now only endorse one Pinterest course — Pinning Perfect. Brittany’s story is still really powerful so please listen but if you’re looking for a course take Pinning Perfect. It’s the best out there. Are Pinterest Marketing Courses Worth It? I asked a few people to take the course before we released it to the public, just to work out all the bugs. My friend Brittany was one of those beta testers and joined me today to talk about her results. Brittany started her blog, Paper Trail Design, in January of 2016. Brittany and I worked together on the blog Frugal Living Northwest. She tossed around the idea of starting an online business for months. At the time, she felt like creating printables was her best skill set. From the beginning, she knew Pinterest would be important for her, simply because when she herself needed printables, she always went to Pinterest first. But Brittany dove in with no idea how to market on Pinterest or how to use the platform to her advantage. She felt very overwhelmed with how to begin and really felt like a failure before she even began. When Brittany started her blog, she did have a Pinterest page but she had no idea how to use it. She says it felt very barren. She was pinning once when she posted a new piece of content, but that was it. Ignoring Pinterest seemed easier than figuring it all out. The very first thing that Brittany did was to get Tailwind and begin scheduling 5-10 pins per day. She thought that to be successful on Pinterest, you had to pin 50-100 pins per day and she knew she could never keep up with that. But five to 10 pins? That was definitely doable. Brittany had about 20 boards when she started blogging but added more after she learned about boards in the Master Course. Learning how to join and participate in group boards also made a real difference for her. At the time, she only had about 30 followers on Pinterest, so joining group boards proved to be somewhat of a challenge, but she overcame it. Group boards are not as important now as they were, but at the time, they helped her to grow and become more confident. Brittany had an ever-evolving strategy for blog posts, but taking the course taught her a few things she didn’t know. Hiding pins within posts, making her pins longer (735 x 1800), and “all those other fancy things” she once didn’t know was becoming second nature to her. As for making images of her printables, Brittany uses a piece of software she’s had for years but almost nobody ever mentions. It’s called Art Text , and she likes it for its ease of use and capabilities. When Brittany started her site, she had around 15,000 pageviews per month. By the end of April, she saw 40,000. When May came, she started making income from the blog ($300), and a few of her printables became more popular. Things like graduation and teacher appreciation printables were taking off. Three months later, it was back-to-school season and Brittany saw another upswing in growth. At that point, her pageviews broke 100,000 and she has stayed above it ever since. Increased pageviews have brought increased income through ads, using Ad Thrive, and through affiliate programs such as Amazon and Share a Sale. When asked what advice she would give to others as they begin a Pinterest course, Brittany says patience is key. Just knowing to expect slow growth is important. She admits to feeling like quitting in her first two months. Quality content, combined with consistency in pinning will bring blog growth. Brittany can now see that she has a real business, not just a blog where she shares printables. The income she makes isn’t just supplemental anymore; it could grow to support their family if she needed it to. She also loves seeing people using her printables and how they personalize her creations. One of the changes Brittany has made in her work is increasing the number of pins she posts per day. She is now up to 20 pins per day and works to keep her queue on Tailwind full, pinning 14 of her own posts and 6 other pins daily. In order to keep up this pace, she needs to post three times per week on her site. These posts can vary, simply because some printables take hours to create. She spends three to four hours on most posts and 10-12 hrs per week working on the blog directly. She spends no more than one hour per week scheduling posts through Tailwind. Brittany also recently went through our course How to Master Tailwind and says that it completely changed the way she used Tailwind, saving her tons of time and teaching her things about Tailwind that she never knew. Email marketing presented a challenge for Brittany. Because her blog is dedicated to giving things away for free, she just wasn’t quite sure how to use her email list to her advantage. What she ultimately decided to do was email her list ideas of which printables would be helpful depending on what time of year it was. It’s exciting to see a former work partner start her own thing and see the great results she has had. She went from 15,000 pageviews to over 250,000 in just over a year with only 10-12 hours of work per week. But what really excites me is knowing how helpful this course could be for those of you who are just starting. 20:35 What other courses or tools did Brittany use? Great to know about Brittany success story over pinterest here. Exactly patience is the key, blogging is not a game of single day, where we can have a win win situation. It takes time and growing slowly helps us to examine all the things which are happening around us. Pinterest was earlier not my cup of tea, I was adding pin there, posting around 10 times a day, but the results were zero. I knew that its is one of the great social media platform, which can keep our pins for long run.